26,200 British and French troops are evacuated from the beaches at Dunkirk. Virtually all British soldiers have now been evacuated and so the remaining French troops have taken over the defense of the perimeter. US statement of policy respecting French possessions in the Western Hemisphere. Hitler and Mussolini meet at the Brenner Pass on the German-Italian border to discuss the progress of the war. Goring tells the Luftwaffe ‘There is no unconquerable island’. The Ruhr industrial area bombed by RAF. Vichy publishes anti-Semitic legislation based on German laws. Jews banned from public office. A Greek government-in-exile is formed in Egypt. The RAF’ launches it’s second 1,000 bomber raid (although only 956 took off) and hits Essen, but due to the haze over the city, the results were minimal and the RAF lost 31 aircraft. Nevertheless, Churchill was highly impressed and sanctioned further raids on this scale. The Germans begin a five day bombardment, using all the artillery at their disposal, including super heavy siege artillery, against Sevastopol in order to soften up the defenses ready for the main assault. 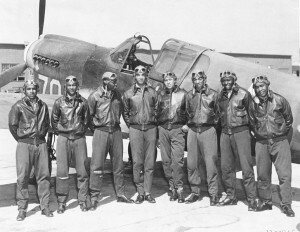 Combat debut of the 99th Fighter Squadron (Tuskegee Airmen) with the US 12th Air Force in North Africa, the first African-American squadron. The Red Air Force bombs Kiev and Roslavl, while the Luftwaffe bombs Kursk. Japanese forces are reported to be in full retreat on Yangtze. U.S. troops are now only 20 miles from Rome. The Bulgarian government seeks terms of surrender from the western allies. The first shuttle raid, operation ‘Frantic’ is made by 130 B-17s of the US 15th Air Force based at Tripoli. The raid attacks rail yards at Debrecen in Hungary and then flies on to Soviet airfields at Poltava in the Ukraine. Secret negotiations between the Romanian government of Marshal Antonescu and representatives of the Soviet Union begin in Stockholm, Sweden. The British 2nd Division begins its advance to relieve Imphal as the Japanese renew attacks on Bishenpur. The Chinese besiege Myitkyina, near the Chinese border in northern Burma.